“I think in a way we’re all Thatcherites now because, I mean, I think one of the things about her legacy is some of those big arguments that she had had, you know, everyone now accepts.” — David Cameron, Radio Four Today Programme, today. He conceded that Lady Thatcher had brought in some “necessary” economic changes to improve Britain but said it was wrong to suggest everyone has wholly accepted her policies. “I don’t feel comfortable saying she was a role model in everything,” he said on his weekly LBC 97.3 Call Clegg radio phone-in. Sounds like he’s just denying being “wholly” a Thatcherite. 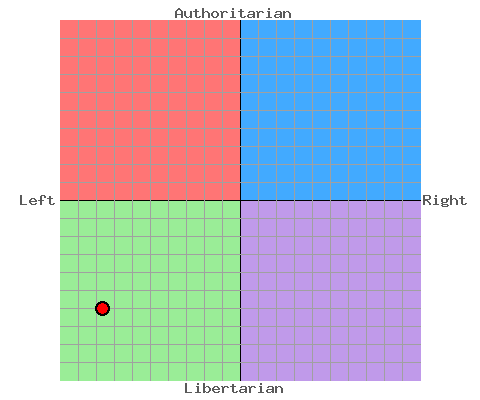 A website called The Political Compass has some interesting charts that map political orientation by answers to a series of questions. 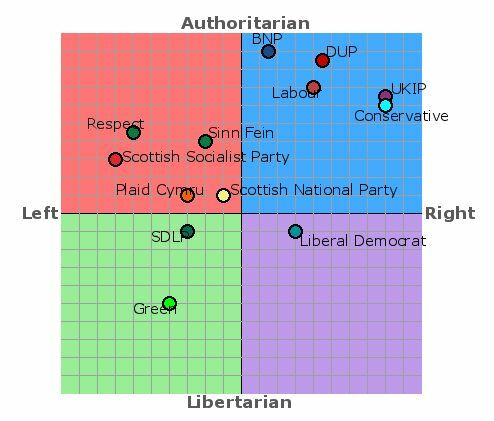 According to the site Labour was with the Conservatives in the Right-Authoritarian (Thatcherite) quadrant at the time of the 2010 general election while the Lib Dems were in the Right-Libertarian quadrant. Since then the Lib Dems have of course joined the Conservatives. They are certainly worth looking at. More information on the Greens at the Bright Green website.